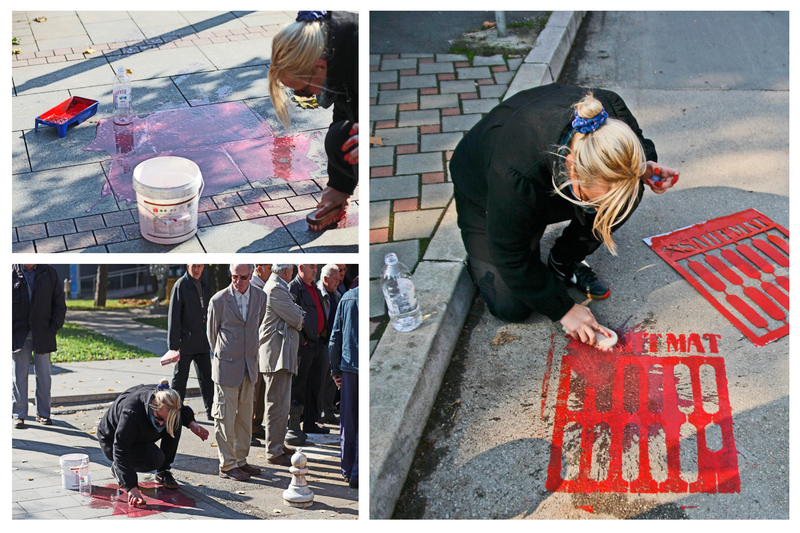 “Šaht mat” [play on words: šah mat = checkmate; šaht = manhole → šaht mat = manhole mate] is an intervention in public space, set up in several places across the city, where there usually are manholes. The final artistic move over socio-political order, the treatment of small towns, the future of the community. These are false manhole covers (stencils) with the statement “Manhole Mate” (checkmate) which ends the game and makes the last move. The work basically draws attention to the lack of empathy in society and society’s failure to notice marginalized communities. The work is accompanied by the documentation in the form of photos taken during the interventions in public space.